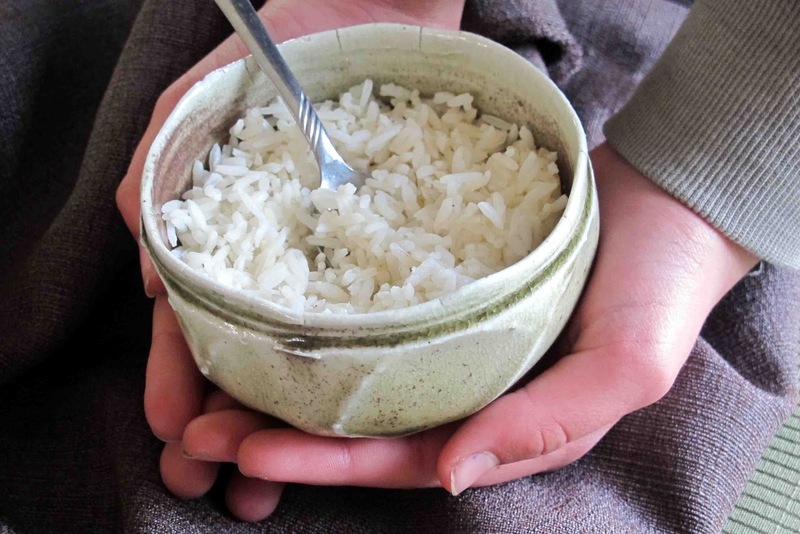 ﻿ I took this photograph of my granddaugher holding a small pottery bowl partially filled with just rice in it to capture the spirit of "Live Below the Line".The bowl was made by Auckland Potter Margaret Sumich. Povery is such a complex issue and so much of it is caused by the wrong kinds of political decisons, corruption and greed as well as natural disasters over which we as individuals have negligible control. But by joining in with hundreds of others in this campaign we can voice our concerns and are more likely to be heard. And as the money raised is going to well known and respected organisations I am confident that it will be used wisely to alleviate poverty and put food on the plate for some families. I do plan to be well prepared beforehand. Over ripe bananas can go into the freezer sliced and packed in zip lock bags ready for breakfast smoothies or an instant banana ice cream. And I'll be raiding the neighour's lemon tree and forage in my own back yard for parsley, rosemary, bay leaves and mint. Most importantly I'll be looking around to see where the cheapest food supplies are in my local area. Lloyd Hayes is a talented chef and a graduate of Jamie Oliver's Restaurant. Together they have created their versions of some classic meals, including a Live Below The Line pea soup, (cheeseless) pizza and an (all bean) burger and chips. The other one was created by www.livebelowthelinenz.co. It also has some really good recipes. I'll be trying out some of these as well as creating some of my own, and shopping around for where to source the cheapest food locally before the Campaign starts. I won't add theThe Ras El Hanout while Living Below The Line as it is expensive. I can buy the other Spices very cheaply from the local Indian Supermarket. 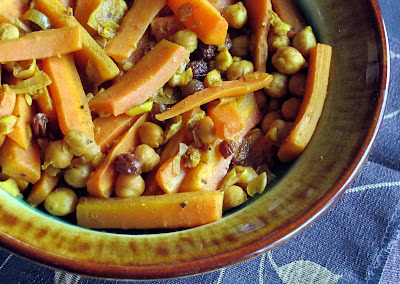 Cans of chickpeas are also frequently on special both in the supermarket and in our local vegie shop IE produce where they have a longstanding discount: three cans for five dollars. Potatoes are one of the cheapest food right now and this simplified Irish recipe is reasonably tasty. as well as filling. Adding in some spring onions at the end adds texture and crunch. You could adapt this recipe by using another green vegetable such as broccoli. Traditionally a spoon woudl have been pressed into each serving to create a hollow and a generous dollop of butter would have been put in this and allowed to melt, but we'll just forego this luxury for now. Boil the potatoes in salted water with the sliced garlic until almost tender. Add the cabbage and boil for a few more minutes until both are tender. Drain and mash the potatoes and cabbage with the butter , milk and crushed garlic. Season to taste with salt and pepper. It doesn't matter if the mixture is still a little lumpy. Stir through the finely chopped spring onions. put into small bowl . Sprinkle with a little parmesan cheese and heat in the microwave. Here is my recipe for cumin potatoes. If you want to add some heat add a pinch of chili powder. Luckily there is a lemon tree in my neighbour's garden which they are always happy to let me me raid. Freshly ground salt and pepper to tste. Toss the potatoes with the garlic and oil. Put in a single layer in an oven dish. Bake at 180 degrees C for 30-40 minutes until the potatoes are tender. They should be crunchy and golden on the outside. Season to taste with salt and pepper and add a squeeze of lemon juice. This afternoon I called in to see my friend Barbara who gave me this recipe. Microwave as many potatoes as required. Chop a couple of rashers of bacon finely and add a little grated cheese. Cut the potatoes in half. Spread a teaspoon of this mixture on each half. Then flash under the grill to melt the cheese. This is an Alison Holst recipe. 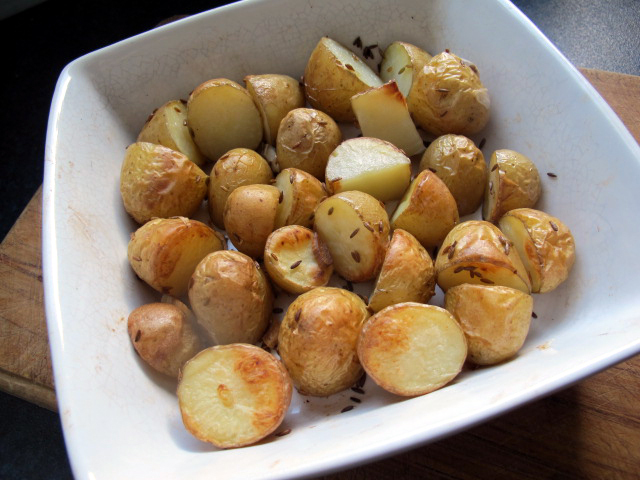 Agria are nicest for these and other roasted potato recipes but they are more expensive than other potatoes. Any other potato suited to roasting would suffice this week. You could ring the changes by leaving the paprika out or sprinkling with other herbs or spices. Method: Scrub the potatoes and cut in half. Cut lines lengthwise and then crosswise on the cut side to make a checkerboard pattern, Cut deeply without piercing the skin. Sprinkle with paprika and , and bake, cut side up for 30-40 minutes at 200 degrees C until the flesh gives when pressed. The cuts should open during the baking. Do not serve with lashings of butter on top. You won't be able to afford it. Scrub potatoes as for baking. Cut in half and place cut surface down on a buttered or greased baking tray. Bake at 200 %C until the potatoes give slightly when pressed. For these crush the potatoes lightly with a fork. They should still be a little lumpy. Stir through a little olive oil, some parsley , and salt and pepper. You could fold through some green peas. Add the noodles and briefly reheat together. 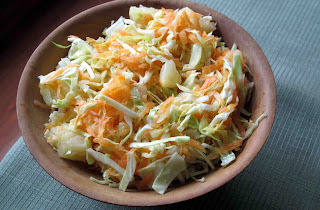 Cabbages and carrots are cheap but the coleslaw I ususally make has lots of mayonaise, raisins and cheese but this will not be affordable for Live Below the Liners . This coleslaw will be cheaper to make and it's also healthier. The banana pineapple slushy is a great way to use up any remaining pineapple juice and makes a not too decadent dessert for one. 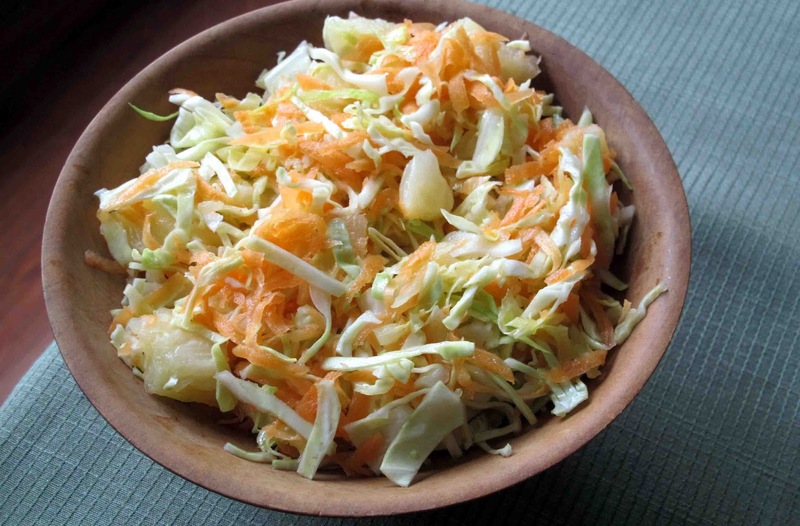 You could serve this coleslaw with a baked potato for a humble dinner. Put the cabbage, carrots, and the pineapple chunks in a large bowl. Stir in 1/4 cup of pineapple juice and 1 tablespoon of olive oil. Two of my favourites snacks are made with pesto, a classical Italian sauce. Freshly made pesto is more fragrant and tastes so much better than that out of a jar from the supermarket. And it’s cheaper. The secret of making a good pesto is to use a good olive oil and nuts which are fresh so it’s best to avoid those from the bulk bins. Stale or rancid nuts will spoil it. Lightly toasting the nuts improves the flavour. I always use the re sealable packets of Mother Earth nuts. They taste crunchy and fresh and will keep well in the fridge for a few weeks (or longer in the freezer). I made several batches of pesto this weekend. We did a tasting of 3 kinds of basil pesto made with Brazil nuts, macadamia nuts and almonds. The Brazil nut pesto was the favourite with a good texture and flavour. The macadamia pesto also appealed, it was smoother but a little oilier. The almond pesto would have been better if I had skinned the nuts first. The texture was a little rough. I also made a walnut pesto with rocket instead of basil which resulted in a peppery flavour. A squeeze of lemon juice enhanced it. One of my favourite snacks using pesto is made with a loaf of ciabatta. For this brush thickly cut slices with olive oil and bake them until they are golden brown in a moderate oven (about 10 minutes). Then spread them with mascarpone (or for a sharper flavour with a mixture of sour cream and feta). On top put a dollop of pesto, a slice of salami, and a slice of tomato. These are quite substantial so will fill the gap if dinner is some time away. The second snack I often make is a variation on a recipe from BBC Good Food by Rick Stein. He cuts puff pastry into little squares and spreads each with pesto. First a half cherry tomato goes on top followed by a little more pesto ,a fine asparagus spear, a sprinkle of grated parmesan and a dribble of olive oil. Then he seasons them well with rock salt and pepper and bakes them in a hot oven slightly spread apart so they have room to puff up) for about 5-8 minutes until the pasty is golden and the cheese has melted. Instead of asparagus I use whatever there is in the fridge at the time such as thinly sliced mushrooms or sliced yellow pepper or a sliver of bacon or may garnish each square with finely chopped basil once baked. Rick Stein bakes them on a greased baking sheet but I find they are easy to lift off if they are put on a sheet of baking paper. Fashion guru Gok Wan, famous for his efforts to persuade women of all shapes and sizes that they can look good naked, has written a cook book. For him food and fashion are like peas in a pod. Both are about love and connecting with people. He knows how to cook Chinese food. His Father used to own a Chinese Take-away in England and taught him the art of the wok when Gok worked there after school as a teenager. The food that was cooked in Chinese Takeaways to please the customers was coated with batter, deep fried and with gloopy sauces. This was quite different from the food his family ate at home. Their diet was more authentic and healthy. When Gok was handed a stash of secret family recipes he knew he had the makings of a recipe book. To some he has added his individual twist. You don’t need to invest in a lot of equipment to cook Chinese food. For Gok a wok, cleaver and wooden chopping board are the only essentials. I found I could make do with a large frying pan instead of the wok. At the beginning of the book there is a description of Chinese ingredients. This made a convenient shopping list. Most of the ingredients were readily available in our local supermarket. I started with his grandfather’s noodle soup, an easy recipe which had only 7 ingredients: noodles, ginger, chicken stock, sesame oil, light soya sauce, oyster sauce and spring onions. 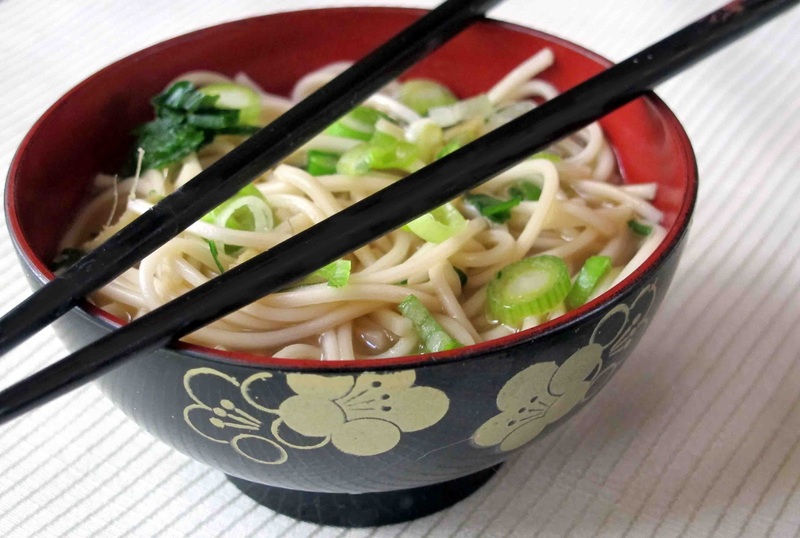 It took only a few minutes to make a bowlful of noodles resting in a soupy broth. It was the kind of comfort food that just slides down your throat. The mushroom soup looked inviting in the photograph with slices of mushroom floating decoratively in a clear broth. But it was an egg drop soup so my soup finished up stringy and cloudy although it did taste good. How to cook Asian vegies is still a bit of a mystery to many of us. The recipe for choisum (a green leafy green vegetable) in oyster sauce was easily made just by tossing it around in a wok with some basic Chinese seasonings. His stir-fried Chinese mushrooms recipe included dried shitake mushrooms which I found in our local Asian food market. They were surprisingly cheap. After soaking they had an earthy flavour and slightly chewy texture which complimented the other mushrooms in this dish. They were stir-fried first and then quickly stewed in a flavoursome broth which included dry sherry, light soy, fish and oyster sauces. The tofu in black bean sauce included black beans which were not available so I had to make do with black bean sauce out of a bottle. Although the tofu did not turn a deep golden brown the dish was tasty and made a good vegetarian main. I love Chinese dumplings so the next challenge will be to make these. Although they could be a little fiddly to make I am sure the end result will be worth it. And there are lots of other recipes I can’t wait to try, fish and meat as well as more vegetarian. Gok’s over the top enthusiasm makes it a fun book to read. The recipes are easy to follow and the dishes I have tried so far tasted really good and were not too expensive. This book is a great introduction to Chinese cooking! I found these lying on the roadside near a friend's house yesterday. She thought they were called Kangaroo Paws. Whatever they may be, they made an earthy table decoration casually arranged in two woven baskets from Zimbabwe. This recipe was first published in my fortnightly column in" The Breeze Auckland,"
There is still time to decide whether to go for an elegant Gentleman's Tiffin Afternoon Tea at the Langham Hotel on Father's Day or baking some treats at home. The Langham will be serving bite sized beef sliders, fish and chips, roast beef with yorkshire pudding, mini pork pies with piccalilli, and rum and fruit cake. To drink, a boutique wine or beer or a cup of tea. Sounds delicious! At home rock cakes would make a perfect afternoon tea for Father's Day. Not just because Dads rock or because Harry Potter was partial to them, but they are very easy for kids to make for their Dads. 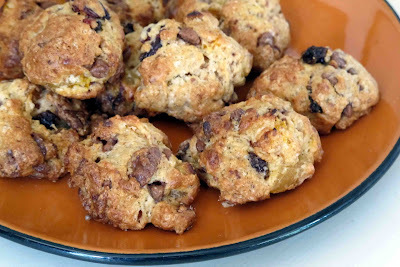 This is my updated version of the Edmond's Rock Cakes recipe. Although currants were traditionally used I decided to make them more indulgent so instead added chocolate chips and a mixture of dried fruit. 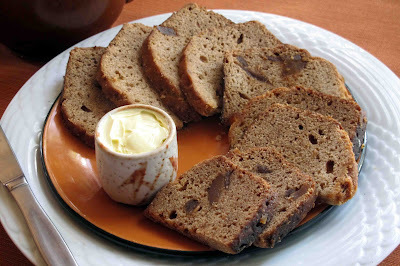 I also substituted brown for white sugar.The cinnamon adds a hint of spice but this is optional.The result was a plateful of very moorish little treats. Put the flour and butter into the food processor. Whizz until the mixture looks like coarse crumbs. Stir in the brown sugar, mixed fruit, chocolate chips and cinnamon. Add beaten egg and enough milk to make a stiff dough. Watch carefully towards the end to avoid burning. A healthy breakfast makes a great start to the day. 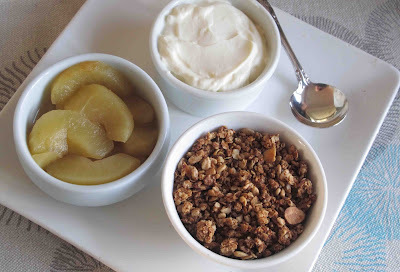 The muesli eaten at our place is a family recipe which was created by my mother in law June who was firmly committed to healthy eating, which is something we should get back to more often! She always served it with stewed apples and yoghurt. Her muesli has travelled all over the word with her grandchildren as they went on their OE’s .They shared the recipe with their friends and flatmates, so that it is now eaten in many different parts of the world. It is simple to make, healthy and tasty and makes for a good start to the day. I always make a double quantity of her muesli so it will last a while.Chopped and dried apricots are also nice to add in after the mixture has been baked. It’s a flexible recipe and we all have our own variations. The second recipe is a version of Bircher Muesli which lends itself well to the addition of seeds and nuts. The original recipe has been around for a while. It was invented by a Swiss , Dr Maxmilian Oskar Bircher-Benner who was born in the 19th century. In his lifetime only the rich could afford to eat meat. 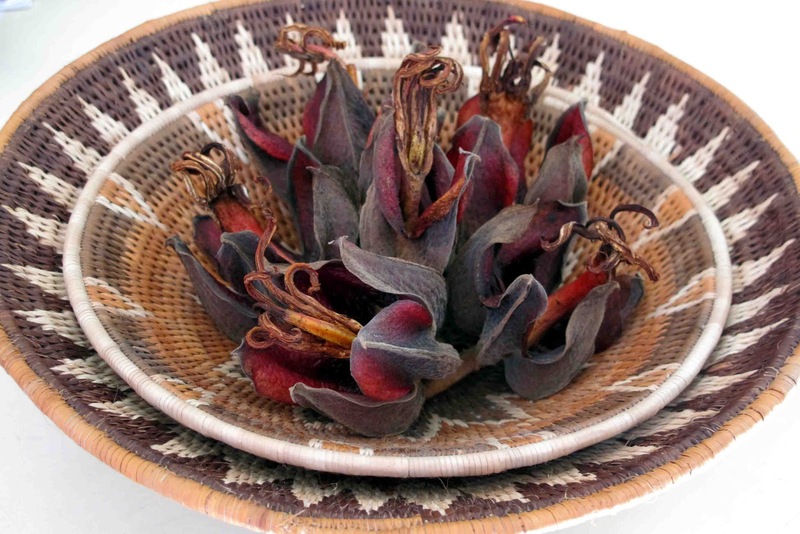 Vegetables and fruits were seen as poor people’s food, and their nutritional value was not understood. He worked hard to change this perception. Most of the preparation for Bircher Muesli can be done the night before but it will take a few moments to grate the apple and sprinkle the sliced almonds on in the morning. The small effort involved is worth it as it makes for a delicious and nourishing meal. With so many seeds in your breakfast you will ensure a healthy start to your day! Optional: When it has finished baking a handful of chopped apricots is a nice addition. 2 tablespoons of sliced almonds. Put the oats, lemon juice, seeds and water in a bowl and leave this mixture to soak overnight. In the morning grate the apple and stir it into the mixture with the yoghurt. Scatter flaked almonds over the top. This morning I cooked the traditional noodles from Gok Cooks Chinese. The noodles are cooked briefly in a gingery broth. Then they are lifted out with tongs and some sesame oil stirred through. In the meantime a little oyster and light soy are added to the broth and it is then recombined with the noodles. Before serving some finely sliced spring onions are floated over the top. Gok used wonton noodles. but I used a packet of handpulled Japanese wheat noodles instead and vegetable stock, rather than chicken stock, which made it a nourishing vegetarian dish. It is almost as fast as instant noodles, and with none of those nasty chemicals and preservatives which some of these contain. This is a very comforting dish . As Gok says " If this dish had arms it would wrap iteslf around you and give you a hug." 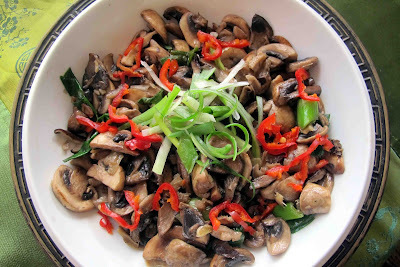 Here is a pic I took of the stir fried mushrooms I cooked from Gok's new recipe book today. The dried shitake mushrooms were from our local Asian food market and were surprisingly cheap. After soaking they have an earthy flavour and slightly chewy texture which complimented the button mushrooms I used. Gok used a mixture of different varieties of fresh mushrooms and this would, I am sure, have both tasted and looked even nicer but this would have made this dish much more expensive. I haven't quite mastered the art of shredding the spring onions to make a decorative garnish. I am in the process of testing some of the recipes before I write a review of " Gok Cooks Chinese." for my regular recipe feature on The Breeze website. 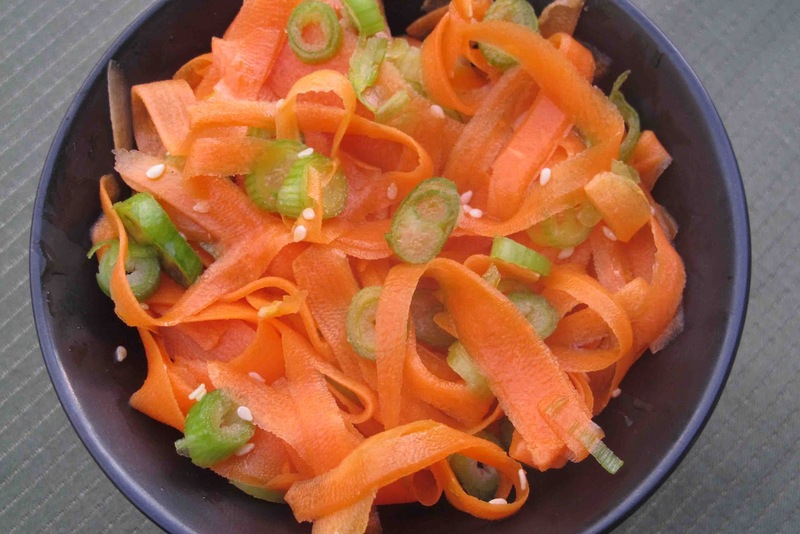 I thought this vibrant orange coloured carrot salad which I photographed this morning says a lot about Gok's vivid personality and his desire to create dishes which don't cost much, take little effort and still taste great. Similar to his fashion guru style in which he make ordinary women look and feel gorgeous without high price tags. According to Gok Chinese salads and garnishes tend to be sharp and simple and more often than not quite sour. This one lived up to its expectation. I didn't quite follow Gok's instructions as I peeled the carrot into long ribbons with a potato peeler rather than grating it. A little more feminine and decorative? This dish, with a crunchy, nutty cheese topping is very quick to assemble and bake. When walnuts are in season this is especially good . Walnuts will benefit from toasting to bring out their earthy flavour. Simply drop into in a hot dry frying pan and stir frequntly for a few minutes until they start to brown and there's a toasty smell. Be careful, they can easily burn. A variation on this recipe is to make a cheese sauce and stir the broccoli and caulifower through this before adding the nutty topping and baking as before. Cut off the stalks and divide the broccoli and cauliflower into florets. Blanch the broccoli and cauliflower florets separately for 4 minutes in boiling salted water until just tender. Drain and put together in bowl.Season with salt and freshly ground black pepper. Stir in 1 tablespoon of butter and let it melt in. Put the vegetables in a greased shallow dish. There should only be one layer of vegetables. Leave them to cool slightly while you make the toppong. In a food processor make 2 slices of white bread into crumbs. Mix the cheese, walnuts and bread together and stir through 2 tablespoons of melted butter. Sprinkle the topping over the vegetables. Bake at 200C degrees for about 8-10 minutes until the cheese has melted and the topping is crunchy and brown. Last weekend I went to the Auckland 2012 Foodshow. On the way around I took some pics of the exhibitors. It was especially enjoyable to taste some new products. 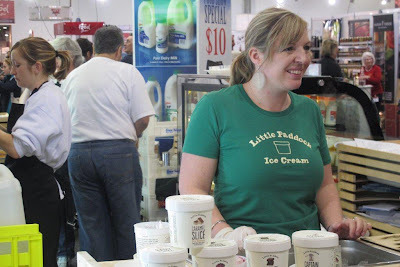 One of my favourites:The Little Paddock Ice cream which came in five delectable flavours. 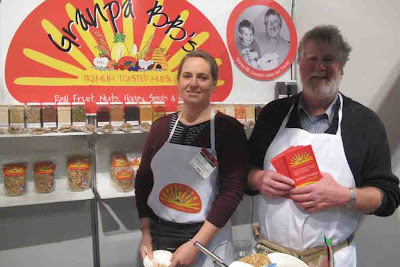 Granpa BB's muesli, made from a family recipe which has been evolving over several decades was an astounding mixture of 20 different healthy ingredients. Equagold was back with a some lovely spices such as Ginger and their European Speculaas spice blend. It's good to see how Asian food and beverages are increasingly making their mark at the Foodshow. Below is the sake stand with a costume to match. Dodoni served up seriously cute marble sized bambini bocconcini. I simply had to take some home. The Tefal Stand, Not only food but also the equipment used to create it has become a focus of the Foodshow. Cheese was plentiful at the Foodshow this year. It is almost becoming a mini cheesefest. Berilla pasta has become a regular spot at the Foodshow. Not just generous tastings but also live cooking demonstrations. After walking around the Foodshow for a few hours the best way to revive was with an Atomic Coffee. And here are the two most decoratively dressed exhibitors at the Foodshow this year.